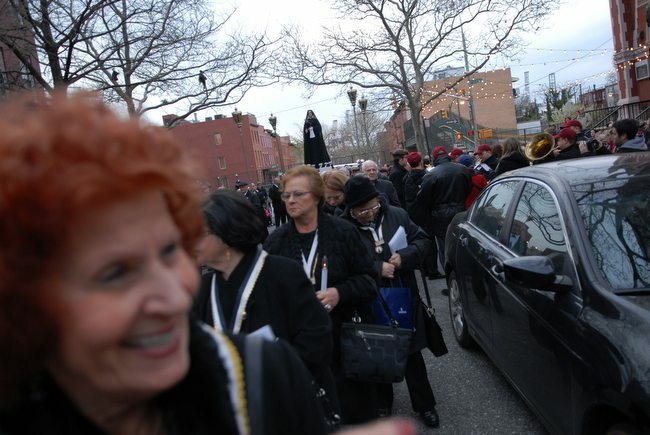 Every Good Friday the Italian community of Carroll Gardens converges on the oldest Italian Catholic Church in Brooklyn — Sacred Hearts and St. Stephens — to hold it’s bi-annual processional through the streets of the neighborhood. This year the procession takes place on March 29, at 7 p.m. Neighbors light up their front yards with purple crosses and robes in celebration of Easter. It’s the oldest such processional in the United States, dating to the 1940s, and carries as it’s patroness a statue of Maria SS Idoloratta, the patron saint of Mola di Bari, Italy. The statue, handmade from wood in Italy, was brought here on a boat in 1948 and has walked the streets of Carroll Gardens ever since. Watch South Brooklyn Post’s video short about the march and its history, above. In recent years, Italian social clubs in Brooklyn have battled over the march, sparking a war of sorts between the more traditional local Italian-Americans and a more modern movement, based in Bay Ridge; a battle that has pitted families and to an extent, men and women, against each other, and has involved mediation by the Brooklyn Catholic bishop. This year the Good Friday parade launches at 7 p.m. from the church, located at 125 Summit Street, at Hicks, on March 29. A marching band will play a solemn tune and men will carry the heavy statues of Jesus in a golden casket, and Mary in mourning, wearing a black dress and with a dagger through her heart.